Palestinian amora of the first half of the third century; son of the sister of Bar Ḳappara; pupil of Simeon ben Laḳish. His name is connected with several halakot (Yer. Hor. iii. 5), and he handed down a number of halakic opinions in the names of Aḥa, Ḥanina, and Johanan (Yer. Ber. vi. 1; Sanh. iv.). 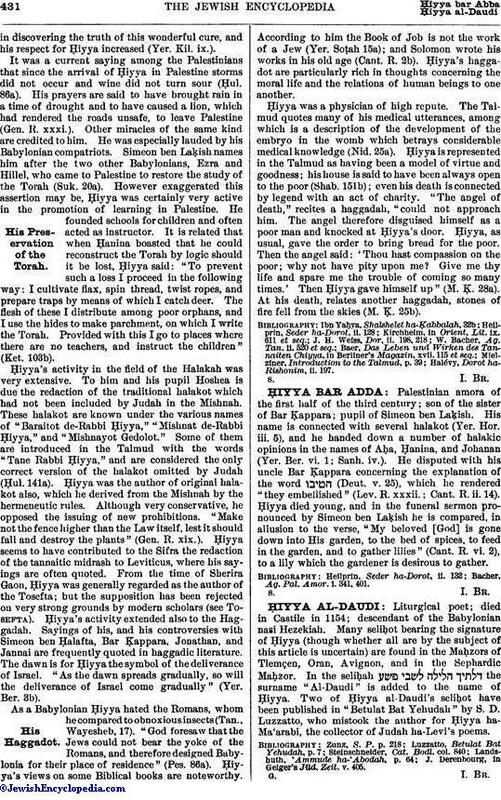 He disputed with his uncle Bar Ḳappara concerning the explanation of the word (Deut. v. 25), which he rendered "they embellished" (Lev. R. xxxii. ; Cant. R. ii. 14). Ḥiyya died young, and in the funeral sermon pronounced by Simeon ben Laḳish he is compared, in allusion to the verse, "My beloved [God] is gone down into His garden, to the bed of spices, to feed in the garden, and to gather lilies" (Cant. R. vi. 2), to a lily which the gardener is desirous to gather. Bacher, Ag. Pal. Amor. i. 341, 401.